I completely forgot to post about the bench I painted. Here’s the photos from it. 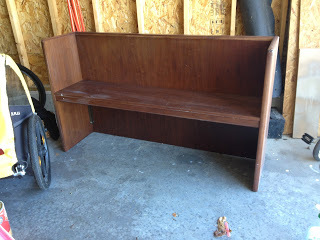 Here’s the bench I bought at Habitat for Humanity Resale shop last summer (yes it’s a church pew). Kyle is happy to have it out of the garage! I sanded it and forgot to prime…oh well. 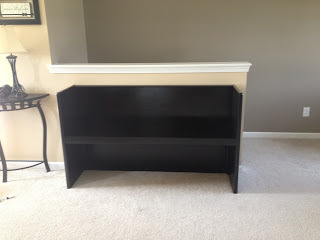 So I had to paint more black on it. But I think it turned out great! I did a coat of polyurethane on it to make sure it won’t mark or chip. 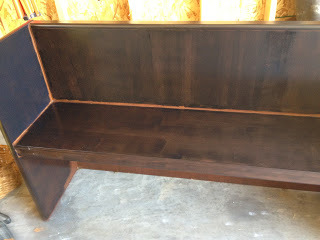 I still would love to make a cushion to go on the bench and baskets that fit underneath to go all along the bottom. 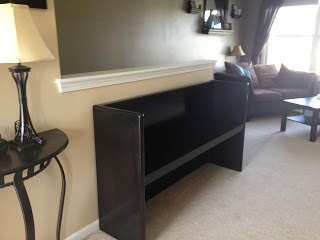 We like it and it provides an extra touch along the half wall.